Today marks just a day under a month away from the Danskin SheRox Triathlon. I've been "training" for this year's tri on a fairly consistent basis, swimming once or twice a week, running on the treadmill two or three times a week, and of course, biking two to three days a week. Yes, I do have time off that's not devoted to exercise, and some days I do two things such as swimming and running or biking and running, or yoga and running. I've temporarily stopped weight lifting, as I'm getting all the cross training I need at the moment. The muscle building isn't as big as I'd like, but my body is toned and things are redistributed enough that I'm pleased with how I look these days. While I haven't had much inspiration to blog about, no great recipes, no momentous bike excursions, I also realized that I've not written much about the upcoming triathlon. 2nd time around, it feels like old hat in some ways, but that's not to say I'm taking any of my preparations lightly. In fact, I am starting to become nervous about it and thought I'd share some tips to folks who read this and may also be doing the Danskin SheRoxTri this year too. One of the best tips I can offer is to go and watch a triathlon if you can. While the experience of doing one is so uniquely different than watching, you can get a great sense of what a sprint triathlon is like. The set up areas, the course, the amazing feeling of camaraderie and energy in the air. It's also important to know how the gear area is set up and what are good ways to set up your equipment and bike. Last year I went to watch two tri's before my first one, and checking out the course and set up areas was a big help. Of course, you see bikes that are totally tricked out and full of great aerodynamic gizmos and handlebars - not necessary for us beginners/novices. Bike shoes do not have to be pre-clipped onto one's pedals for faster changing transitions. Aero bars, water bottles pre-set with feeding tubes and taped-on food are all not important unless you are an elite racer. Keep your gear simple! Another great tip - if you have not ridden your bike, in say, about a year - get your bike out of storage! Get it to a bike shop and get a tune-up. The tires need air, the dust needs to be wiped off, and most likely you need to lube the chain. You might also want to consider learning how to use your gears a bit. I keep my front gear - one of the three front cogs, in the middle gear. For my bike, that's the middle ring, or position 2. My back cogs/gears, I keep in between position or gears 3, 4 or 5; rarely in a harder or easier position to pedal unless I need the easy granny gears for up hill, or in harder to pedal position for down hill. 21 speeds or more? You only need to be in 3 places for most of the bike course. Final tip - go at your own pace. Simple and stupid and oh so obvious. I had a real light bulb moment a few weeks ago when I was swimming. Mentally rehearsing my swim course, I realized that I need to do some warm-up laps and that I cannot swim too fast too soon or else I panic, lose my groove and forget to breathe. If I swim or run slow, it's okay. I am not in this tri to compete with anyone else other than myself. 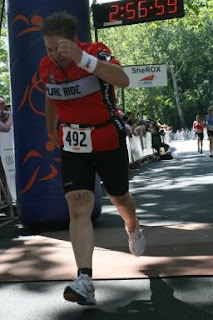 My goal this year is a) to complete the tri, and b) to do better than I did last year. I'd like to swim more efficiently, bike faster and feel secure, and run a steady pace for the whole 5K. I can't be faster than I'm capable or else I'll not find my rhythm. Swimming is a so different than the other two race pieces - you have to breathe differently and getting into the motion and not wasting energy is important. I took swimming lessons this year and I've improved drastically. I'll never win a speed race but I sure will be able to do more than doggie paddle this year. Slow and steady wins your race. If any other tri-gals are reading this and you have any questions, shoot me a comment or send an email my way - dgorniak@comcast.net I'd be happy to share whatever little pearls of wisdom I have about my sprint tri experiences. Any day where a sportsman has to perform is important in his life ..